For every single time I've stood at Arnage Corner at the lovely Circuit de la Sarthe (which hasn't been as often as I would have liked) there must be at least, a 100 times I've stood at C1 at the Madras Motor Race Track in Chennai, or the Kari Motor Speedway in Coimbatore, watching a slew of Indian Touring Cars going by. Or the curious assortment of formula cars that we had on offer. This is "back then" although I'm sure older hands will remind me that a decade isn't really a very long time. But my version of back then is still different from the present. And in this version a snake, peacock, the odd dog or pig sighting at the track wasn't unheard of. Nor was the fact that a view from the pit lane, post race, would often allow one the sight of people actually slugging it out. Whether it should have been like that or not is immaterial. And it made for some interesting tales. For every single time that I've been at any manner of motorsport event in any other part of the world, there've been countless times I've been lying in wait for a rally car in the midst of the wilderness somewhere in some corner of the subcontinent. 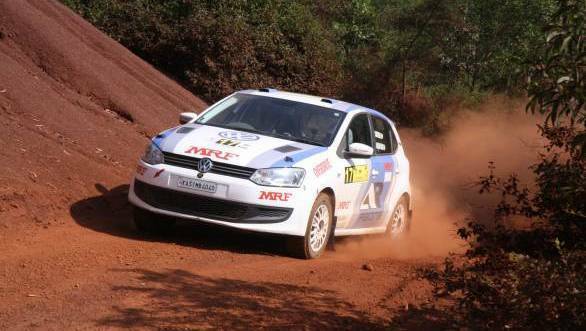 It was terrific, irrespective of the outcome of the photographs, when the rally machines would go by. The times that were terrible were when stages were cancelled, because we'd only figure this out after lying in wait for quite a long time. Then we'd trudge all the way back out and find our way to the next stage. Maybe a little more tired than we'd have liked, but with unchanged levels of enthusiasm. For every single time I've been at any racetrack in any part of the world, I've spent countless more within the four walls of an office, finding the AC far too cold, finding the glare of the computer screen too bright, and finding the chatter all around me a little too loud. Or, as the case is now, at my desk in the home office, finding the weather too cold, the glare of the computer screen still too bright, and somehow still finding that I need to shush the flat's only other occupant. At any rate, I'm writing this for you. The young motorsport fan, the aspiring motorsport writer, the hopeful motorsport journalist. Because it's important that you know this before you sign up for a career with an Indian auto magazine. And more importantly I'm writing this to you, because you so often write to me asking how you can also have this very career too. See, here's the thing, everyone sees the photos from Le Mans with race cars in the shadows, their headlights and LEDs creating magical streaks in the dead of night. And people see the odd interview with a slightly more prominent driver and think that you got lucky. What they don't see, is the other side. Waking up with a crick in your neck, with your keyboard imprinted on your face, because you'd fallen asleep ?in the media center at 4am for 40 minutes. Nor the time you sat in the ?car, rain soaked, resizing images and posting them online, or hurriedly WhatsApping them to colleagues in other parts of the world who would take it from there. Or the time you were so knackered that you recorded voice notes to send a to colleague who then kindly typed out a web report deciphered from your sleep addled stream-of-consiousness babble. Or the time you needed to wash your face at the racetrack with contact lens solution, because there was no water on offer at all, and you needed to look moderately presentable before an interview. Which is why I think it's important to say this. Chances are if you don't enjoy watching a pack of tin tops barreling down the start-finish straight at the MMRT, Arnage will only enthrall you once. And briefly. Chances are if you don't like watching Gaurav Gill's Mahindra SuperXUV do things that a machine that size simply shouldn't, then you're unlikely to be too impressed with the exceedingly early starts that the WRC entails even if it means you get to see a car airborne like never before. And if you don't learn to delight in interviewing a braces-wearing race car driver, who might now be very prominent, but back then, like you, was just another kid at the race track, you'll never survive the many unanswered emails for your many interview requests with many racers that the world seems to admire. And if you never survive the many emails that go unanswered you'll never learn that the secret to actually landing that interview lies in that one email that you almost decided not to send. But if you still want to do it, and you're willing to do the hard work, know this. You will have to try and be right. You will have to face the fact that try as you did, you might have been wrong, and you're going to have to do better next time. And you're going to have to accept that when you're wrong, people will tell you that you're wrong. And when you're right people will still tell you that you're wrong, but hey, you've still got to keep at it. If, despite my best attempts to warn you, you still insist on wanting, coveting, desiring motorsport, I say wear comfortable shoes and pack a snack. I usually go with a Snickers bar. This column first appeared in the August 2018 issue of OVERDRIVE.